I go through phases with breakfast. Sometimes I’m all about making smoothies, other times it’s all about the oatmeal. Granola and yogurt, toast with peanut butter, poached egg sammies, and avocado toast have all had their time as well. I’m not sure what drives it – it could be what I happen to have on hand, what was on sale that week, or a recipe I saw in a blog post. But right now my current breakfast phase isn’t so much about a certain food, but more about how I consume it. I’ve taken to wanting to sleep in as long as possible before work, and therefore needing breakfasts that I can grab and go. Yes, I know, it means I’m eating at my desk, but it’s the perfect thing to do as I catch up on morning email and prep for meetings and other tasks that day. Plus sleeping in – did I mention I am totally not a morning person? One thing I miss about grab and go breakfasts is that I don’t get to eat oatmeal very often. Yes, I know, I could bring instant oatmeal packs to work and make it there, but I hate all that extra packaging, and it just doesn’t taste the same as oats made on the stove. And while I like my smoothies and yogurt parfaits that I usual grab, I’m missing my oaty goodness. Until I remembered overnight oats. 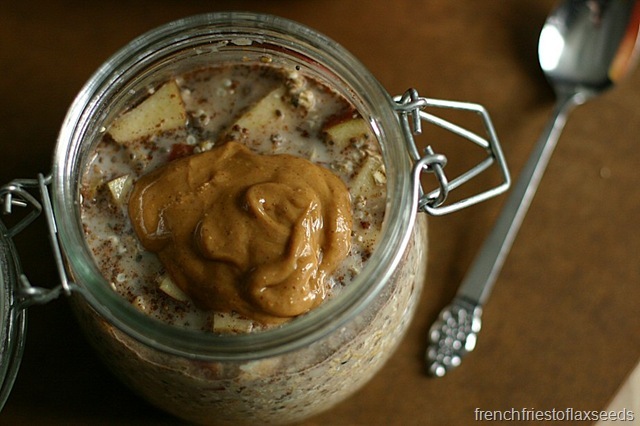 Now overnight oats are clearly not a new thing. I’ve made them before. They are all over everyone’s blog. In fact, muesli has been around forever (ps – I happen to have an excellent muesli recipe you should check out), and I would argue that overnight oats are basically the same thing. It’s just that I never really think about making them. Until the other day, when I realized I had a bunch of apples in my crisper, and I wanted to have apple oatmeal, but didn’t have time to make it. Somewhere the lightbulb lit up, and soon enough I was grabbing ingredients, mixing them together, and running out the door! My goal was to have a filling, delicious mix that reminded me of apple pie without adding any extra sugar, and that packed a good nutritional punch. My experiment turned out amazing, and I’ve made it multiple times since then – not only for quick breakfasts, but also for a one dish lunch. I make sure to use a sweet crisp apple, like a gala or fuji, and added raisins to give additional sweetness just like an apple pie. 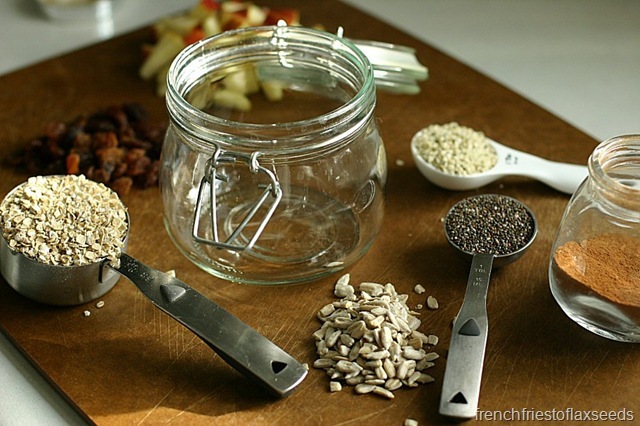 The combination of oats and seeds provides fibre, protein, and healthy fats, with the chia seeds giving it a nice thick texture. I love to top mine with a scoop of peanut butter (or other nut butter) because somehow I don’t think “à la mode” would be appropriate (or as portable) for breakfast. And because peanut butter makes everything better. Now go get your breakfast ready for Monday morning, and you can hit the snooze button an extra time. 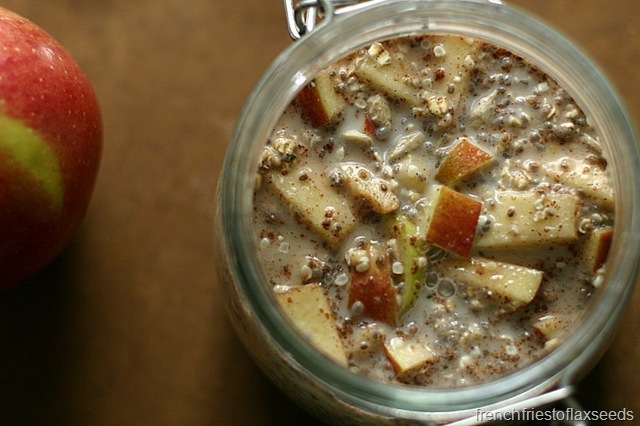 Love oats but don’t have the time to enjoy them before work? 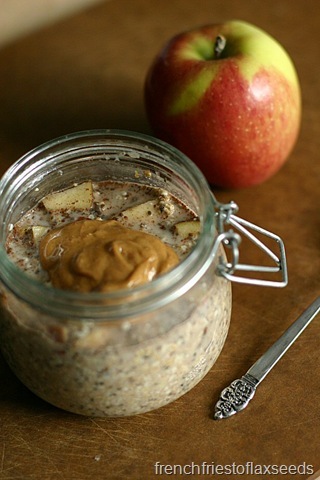 Overnight oats are the answer! These oats are chocked full of cinnamon apple flavour just like your favourite apple pie, but with the addition of fibre and healthy fats and none of the added sugar. They are easy to make, and suitable for a variety of diets. And really, who doesn’t want to eat something that tastes like pie for breakfast? 1. 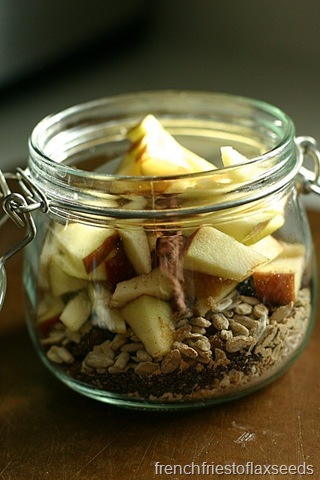 In a bowl, mason, jar, or other container, combine all of the ingredients, mixing well so they are evenly distributed. 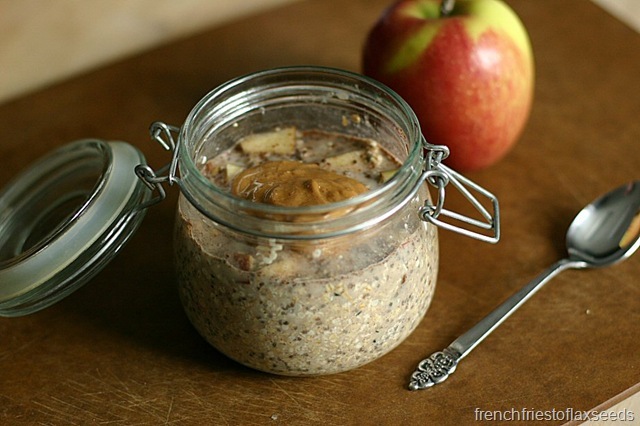 Allow to sit for 30 minutes to overnight (in the fridge), then enjoy with your favourite nut butter. Note: Use certified gluten free oats for a gluten free version, or substitute quinoa flakes instead. Tell me – how do you like your oats? Cooked on the stove top, instant, overnight, baked, or something else?